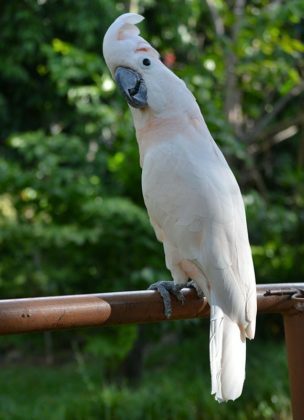 The Moluccan Cockatoo is a long-lived and large bird that displays a striking appearance and is very affectionate. These qualities have made it popular among per bird owners, but care must be taken if you plan on joining their ranks. These beautiful birds can be very demanding of your time and attention. If you think that may be an issue, then this bird is not for you. 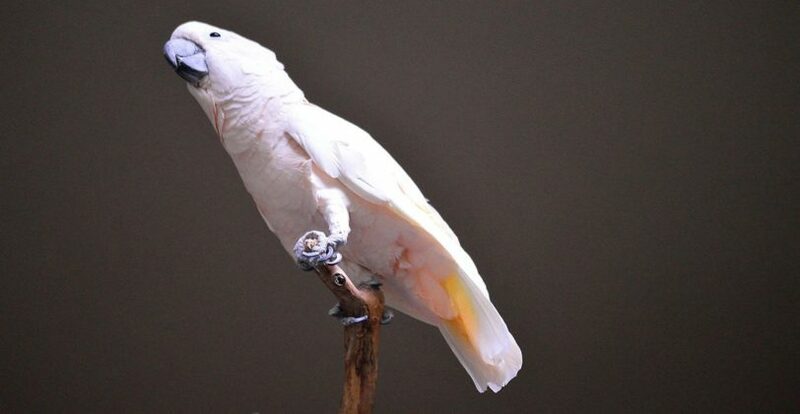 The Moluccan Cockatoo is also known as the Salmon-crested, Rose-crested, and Pink-crested Cockatoo due to the pink feathers that form the majority of their crest. These companion parrots go by the scientific name Cacatua moluccensis. They are native to the South Moluccas and Indonesia where they are listed as vulnerable by the IUCN. In the wild, they favor lowland forests and eat nuts, seeds, berries, and insects. These large birds measure from 15.5 to 19.5 inches (40-50 cm) and weigh between 27 and 32.5 ounces (775-935 grams). Their bodies are a soft peach color with a dark, bright peach crest. Males have black eyes while the females’ eyes are brown, but this is the only physical difference and DNA testing is recommended to be certain of your bird’s gender. What is it Like to Live With a Moluccan Cockatoo? Expect a bird that is very energetic, loud, potentially destructive, and demanding of your attention. Screaming is part of its natural behavior and is especially prevalent in the morning and evening. You need to be tolerant of some loud screaming even in the case of a well-adjusted and happy cockatoo. Birds who are stressed or have behavioral issues can develop into problem screamers who go at it all day long. These birds are extremely intelligent and require extensive mental stimulation. They are very social and you can keep multiple Moluccans together. Caution needs to be taken during mating season as aggressiveness can lead to injuries and even death among competing birds. Close bonds are formed with their mate, either human or avian, and according to beautyofbirds.com, when separated from this mate they can develop severe emotional problems. They will want to be with you all day long if they can. 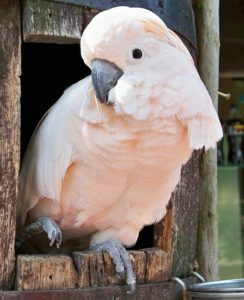 Cockatoos are prone to self-mutilation and can resort to this disastrous behavior if they are neglected or denied sufficient mental and physical stimulation. Moluccan Cockatoos have incredibly strong beaks that can generate up to 500 pounds of pressure. This makes them unsuitable for small children as no matter how tame your bird appears, there is always room for an accident. If not properly socialized they may attack humans who are not their mate. The intelligence that these birds exhibit make them very adept at learning tricks. While they can mimic human voices, they are not the greatest of talkers. They can learn simple tricks like stepping up and repeating a sound as well as more complex tasks such as retrieving an object. Training requires patience and repetition with plenty of positive reinforcement. Clicker training has also been used successfully with cockatoos. Males can become aggressive as they age and may need constant training to curb this conduct. These cockatoos are extremely destructive of their toys and you will need to constantly replace them. You should be very wary of allowing you bird unsupervised access to your furniture as it can quickly do substantial damage to your belongings. How Do I Care For My Moluccan Cockatoo? Moluccan Cockatoos generally do well at temperatures between 70 to 80 degrees Fahrenheit (20 to 25 Celsius), though babies need to be kept at very warm temperatures to survive. Your bird will do best on a pelleted diet supplemented with fresh fruits and vegetables. Care must be taken in choosing the correct cage if you are planning on keeping one of these challenging birds. Their intelligence combined with the strength of their beak demands a formidable enclosure. Stainless steel or wrought iron is the recommended material for your cockatoo’s cage, and a bar spacing of 3/4 inch should work well. Your bird cannot destroy this cage. Plenty of chewable toys should be spread around to keep your bird entertained, and they should be rotated weekly. You should plan on plenty of out of the cage time for your bird to get mental and physical exercise, but it will spend a good portion of its time in its cage. These birds love to climb and will appreciate a tall and roomy cage. A rectangular-shaped cage of at least 36″x48″x72″ is suggested as a minimum size by birdtricks.com. They also suggest that you avoid “guillotine” type doors as they can be a danger to your bird as it attempts to escape. Cockatoos are powder-down birds and produce an excess of bird dust. Their nails will need to be filed, as can be seen in the video above. They like to bathe and many owners find a shower perch is a perfect solution to help their birds stay fresh and clean. Molting begins at about 9 months of age and should not be very noticeable as it is a gradual process through the year. These birds breed readily in captivity and the breeding season is from December through March. The females produce 2-3 white eggs that will take about 30 days to incubate. How Long Do These Cockatoos Live? These birds can live more than 60 years in captivity and so demand a lifelong commitment. Common health problems include fatty tumors, PBFD, and obesity from lack of exercise. Feather-plucking to the extent of self-mutilation is a problem due to their dependent nature and complex emotional needs. Expect to pay $1000 to $2000 for your Moluccan Cockatoo. Many are available for adoption as previous owners could not handle their substantial needs. You also need to be prepared to purchase a large and very strong cage along with an endless supply of chew toys that will end up being destroyed. These are expensive birds to maintain. To see the prices of other cockatoos click here. 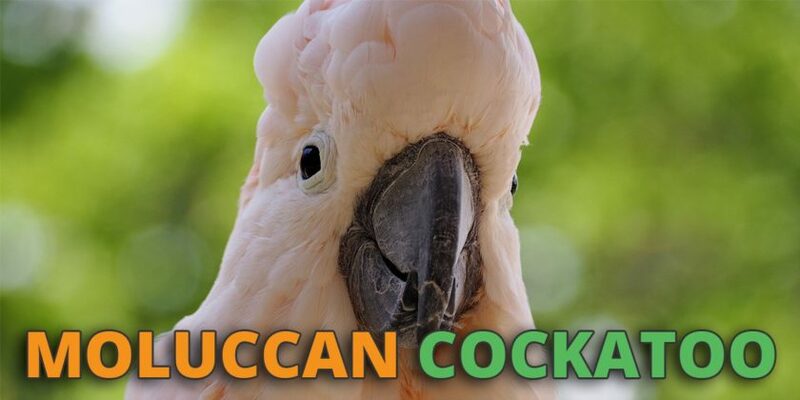 Is A Moluccan Cockatoo Right For Me? It is said that these birds are not right for 99.9% of bird owners. They are very demanding of your time, are very loud and require a lifetime’s emotional and financial commitment. If you can fulfill all of their needs and are ready to devote a good part of your life towards keeping your bird happy, then this intelligent avian companion may be just right for you.